Oh how I miss Cache Valley. . . It was a cool/chilly morning and the three of us decided to go for an easy spin just to make sure the legs and equipment were operating and behaving as they should. . . This was the 30 year Anniversary for LOTOJA. . . This is packet pick-up and my good friend and riding buddy patiently waiting our turn. . .
it’s so very difficult to be patient! There is so much energy at these events, the entire summer of work and training is finally coming to an end and when all these athletes gather in one place. . .
. . . well, there is a tangible excitement and anxiety in the air. first we get stamped. . .
in order to get this cool little stamp, you must be registered and then present your Photo ID proving you are who you say you are. . .
this is how the LOTOJA peeps know who is officially riding and racing at the start line. without this stamp, they will not let you start, so it is very important! The car is ready. . .
now before you are impressed that includes all of my indoor training hours through the winter months too. 1600 of those miles were done indoors on a trainer over the winter. The trainer part is where you should be impressed!
. . . riding indoors on a trainer is pretty tough!!! My goal for 2012 was a sub-12 hours which in my mind is pretty lofty, and today was the day the many hours of training paid off in the accomplishment of a challenge I set for myself . . .
My goals for 2013 are the same. . .
to finish this ride faster than last year. . .
. . . but the training hasn't been NEARLY as focused or consistent. . .
in fact I've kind of struggled. . .
but I committed to doing my best with what I have! Cyclists fill up an entire block! This picture was taken at approx 6:45 am. . .
so this crowd is about 1/2 the participants. . .
. . . that’s a lot of bikes! Here we are in the starting gate! meaning they have their blue stamp and wrist band. Then at the appointed time, they start the timer for your pack and off you go, the ride has officially begun at this point. . .
all appears pretty quiet, but my inner thoughts each year has always been. . .
definitely not calm and quiet on the inside. . .
. . . then we are on our own. This is the pack I was in. . .
notice that there are some great pictures that you have never seen before. . .
here we go, no turning back now, I certainly hope I’m ready for this. . .
this year was even more different and in some ways more exciting than usual. . . Here we are, the Women’s citizens group 35+ and 45+ all headed to Jackson Wyoming. . .
there are a few peeps who think we are slightly nuts for doing this, and yes we sign up because we WANT to do this ride! For me, not only is it something that I can say “I did that”, but it’s fun, and my support crew, which consists of my kids and family agree. . .
we look forward to LOTOJA every year. . .
it's sort of like Christmas, as soon as it’s over, we begin planning for next year to go again. . .
we ride through a lot of country roads, and it is beautiful. Coming into Preston. . . I heavily debated whether or not to stop in Preston this year, but there were a couple of newbies on the support crew team, and I felt it was important to give them the experience of Preston. While it did slow me down just a tad, it was worth it. However, next year I will ride through without stopping. getting to Preston, which is only 35 miles, is a good basic warm-up for the rest of the ride, and I don’t find it necessary to stop there now. The first couple of years I appreciated it, as I was pretty stressed about the whole ride and needed the mental and emotional boost from my support crew and family. The night before, it is important to predetermine which “zone” within the feed-zone you are going to stop at. each of these red signs are assigned a number. . .
which is visible from the other side. . .
and we determined that we would meet at #6/7 meaning I would ride my bike to the end of 6 and the beginning of 7 and my support crew would be waiting there to give me water, nutrition, an encouraging word, and a hug as they sent me on my way. The feed zones are between 35 and 47 miles apart, Preston which is a fast flat 35 miles has the lightest crowds as many cyclists choose to by-pass this stop. . .
. . . like I will next year. One of the additions we had this year is a baby. . .
and it is a LONG day! the average drive in a car to Jackson from Logan takes a little over 3 hours, on a bicycle it will take the very fastest riders 9 hours and me. . .
well about 11-12 hours. . .
so it is a long day, a VERY long day. this is our little Oreo. . . and we love him! the most congested feed zone of the race, also the most important. . .
one year when I was running support crew, I missed my brother . . . I still don’t know if he has forgiven me! What is tricky, is that it is also the most congested, and the most cumbersome to get to, simply because motor traffic. . . ie: support crews . . have a detour that goes so stinkin far around to get to the next destination after Preston, it’s called the Treasureton Cut Off and consists of a dirt road through desolate farm country. Did I mention, that you should not miss your rider in Montpelier?
. . . It truly is the most crucial stop in the entire race. It was on the Treasureton Cutoff that Superman received his confirmation. . .
. . . that he was going to marry me! Of course I was completely oblivious to this event and for me I was riding my bike as I had prepared all summer. . .
my entire goal was to get to Jackson. . .
my goal: sub 12 hours. . . This is Afton. . .
and without doubt my most memorable stop. . .
. . . and will be forever etched into my memory. not because, my support crew was not there when I arrived. . .
not because I waited close to 10 minutes for them to show up . . .
or that the wind was cooperating and I was excited about my performance and KNEW the training and focus had paid off. . .
. . . this is where I knew without doubt that I was going to marry Superman! kind of an odd place for the spirit to tell me that, but that is exactly what happened. seriously . . .was that for real??? This is probably the most interesting “your support crew is here” attire I have ever seen at LOTOJA. . . these two most assuredly stood out in the crowd! I’m not here, but this is a great pace-line going from Afton to Alpine. . .
Alpine, Wyoming . . . the final stretch is upon us. 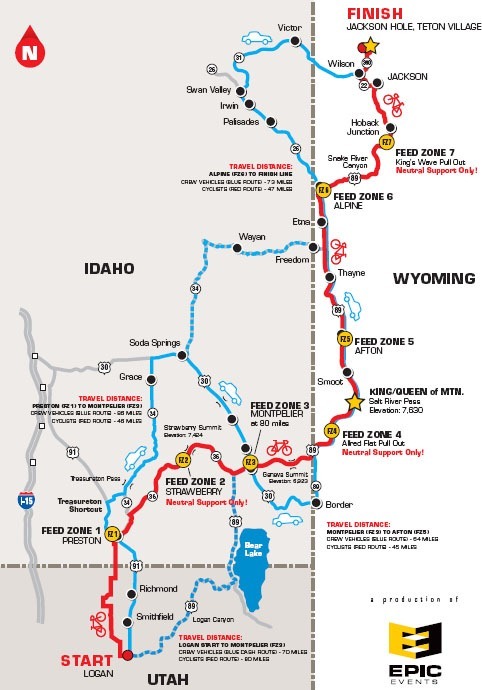 . .
Hoback Junction is the most beautiful part of the ride, it is also the most difficult. . .
in your mind you think you are going to drop down into Jackson, but that is not the case, it is a slight uphill from Alpine and at 160 miles, you are just sort of ready to be done for the day! But here, my support crew. . .
What's up with that anyway???? but I was still in a stupor over knowing that I was marrying Superman and wondering how that conversation was going to come up! that he had the same prompting earlier that day. . .
a beautiful picture of a bridge. I’m not sure if this is the exact bridge or not, but there was a rider the sort of toppled over the top and over the edge and died on this route. . .
. . . . Thanks Superman! I’ve never been in this position for LOTOJA before! I’ve always been at the end of the time cut-off and not seen so many riders still on the road. almost done, and I am so happy with EVERYTHING! I will be getting married, I just had no idea when. . .
. . . Love is a wonderful place to be! My support Crew and family patiently waiting. . .
rolling into the finish line. . .
. . . and it is still plenty light outside! A new experience. . .
one that I happily admit, I thoroughly enjoyed! This was a whole 1 hour faster than last year! Cyclists and support crews waiting at the finish line. . . This was the second big surprise for the day. . . I was even more distracted now, I had to find Superman and at least warn him that he was going to meet my parents for the first time. . . . I had determined to leave the whole married part out of the equation. . .
. . . Awkward moment for the year! and now I get to introduce them to each other . . .
mom, dad, this is the man I am going to Marry. . .
but he doesn't know that yet. . .
. . . try explaing that so it makes sense! Superman . . . are you aware we are getting married????
. . . at least it was interesting in my mind! and this year was a very memorable one to say the least! And now another season is upon us and I am just getting last years events logged! as I write this. . .
. . . so stay tuned! This is Superman’s first race/event and he is soooooo excited. . .
as I write this Sunday evening, he is . . .
. . . he is packing! Stay tuned and we will give you a full report of the Rockwell Relay. . .
an adventure to tell about. . .
. . . of that I am confident! As always, thanks for joining me and sharing in the adventure with me! This is superman. I'm happy that you, Lois Lane and me, Clark Kent made things happen back in March. Cycling has taken a back seat in priorities, but as for trading what we have together....nothing even compares. After all....Love conquers all, right?